Living on a farm, our cats are never short of adventure and fun. From chasing mice in the barns, climbing trees, or wrapping around our legs as we complete chores, they are always up to something. Michael is usually the cat care overseer in our house, so he is especially loved by our cats. Wherever he is in the yard the cats are there- often right on top of him. The younger children love to help Michael with the cat chores. 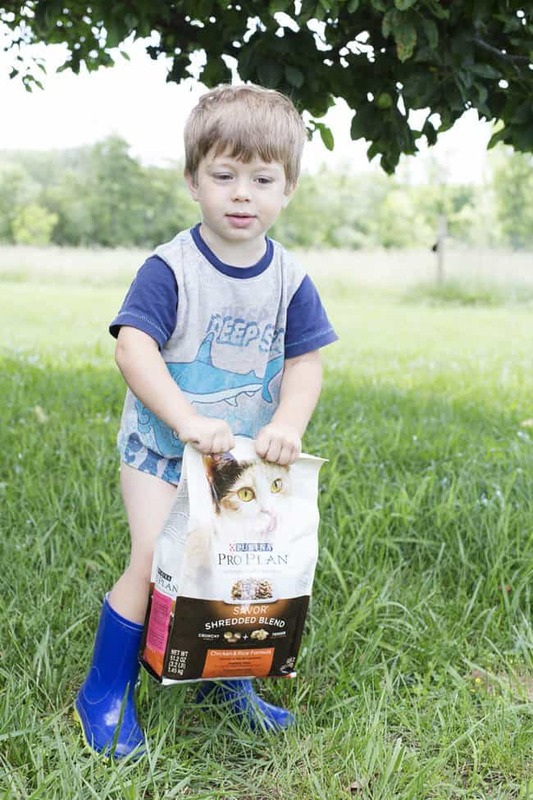 Jonathan was in such a hurry to get outside to help feed the cats this morning, that I didn’t manage to get shorts on him before he had his boots on, ready to join Michael on the walk to the barn. Purina® Pro Plan® is a great choice to ensure our cats are getting the nutrition they need for all their farm life adventures. Not sure of the best food for your cat? Head over to Purina® Pro Plan® and use MyPLAN to find out which food is best for your cats unique needs. Not only will you get a personalized food recommendation, but you’ll also get a $5 off coupon for a bag of Purina® Pro Plan®. 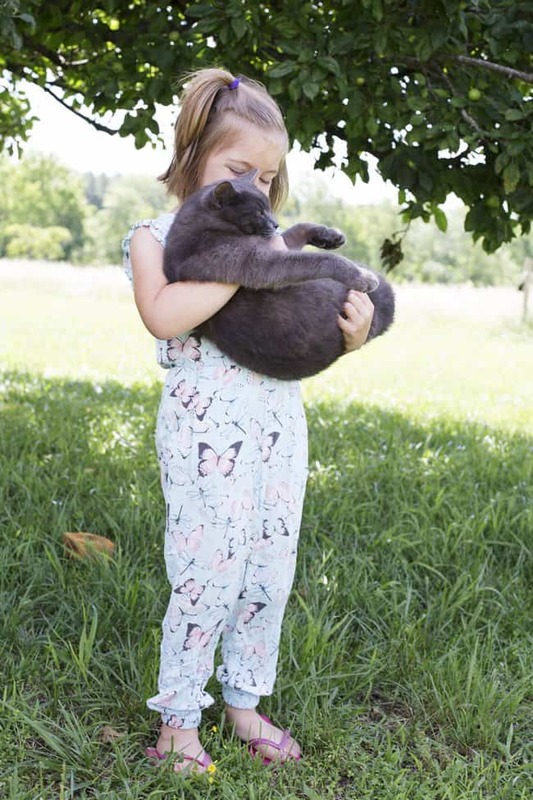 With 6 cat-loving children on the farm Smokey and Jenny have no shortage of love and attention. I think all that (often forced) love has turned our cats into the sweetest, most tolerant cats around. Whether its 7-year-old Peyton climbing a tree to perch in its branches with a cat in her arms, or 5-year-old Emily pretending a cat is her baby, those cats are loved on and handled all day long. I’m not sure which part of our cats life brings the most adventure– being farm cats, or being cast in the imaginary play of 6 children! Did you know that June 15th is National “Take Your Cat on an Adventure” Day? Get inspired to have a wonderful adventure with your cat right here. 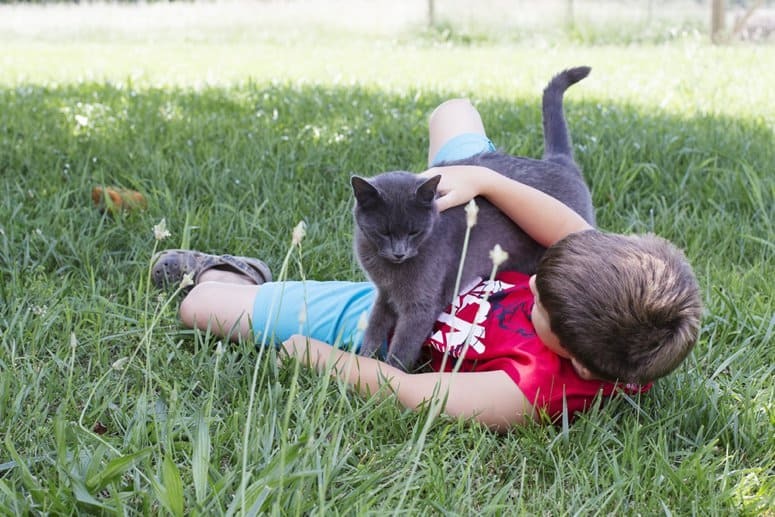 Farm cats have the life and it seems that yours have a lot little ones to give them lots of love. I'm for sure a cat person! I'd have a house full if my husband would let me (insert crazy cat lady thoughts!) Thanks for letting me know that June 15th is National “Take Your Cat on an Adventure” Day! My cat and I will be taking part in that! Beautiful cat! I love the color of his coat! Thanks for sharing! I honestly think all of our cats were farm cats..they brought home critters all the time. Most of the time they were barely alive too...ugh! Your gray cat reminds me of our rogue. She was an interesting cat that's for sure. I love the idea of going on an adventure with your cat. Where we live, they have to stay inside because we have fisher cats, coyotes and bears right in our yard. Very uncool. My mom has had her barn cat for 15 years. They are good friends! What adorable kitties and children! The cats sure do get extra heapings of love! They all look amazingly healthy and happy. They really love their adventurous farm life! That cat looks just like one of my daughter's cats! We have a farm and a barn cat has showed up there. I have no idea how it got there, but we love having him around. What sweet fur babies. How nice that your kids help out with their care. Teaches kids a lot about being responsible. Love the photos! We've always been dog people but your cat is adorable! What a fun adventure and a great way to teach kids responsibilities! I wish I could take my cat outside! She's terrified!! Loved your post!!! I just got my sweet baby spayed yesterday, so I think her adventures will have to be delayed until July. Aren't cats the absolute best? Yours is beautiful, and I'm glad you have a wonderful food for her.